Ignoring the bull in society's china shop is nothing new. 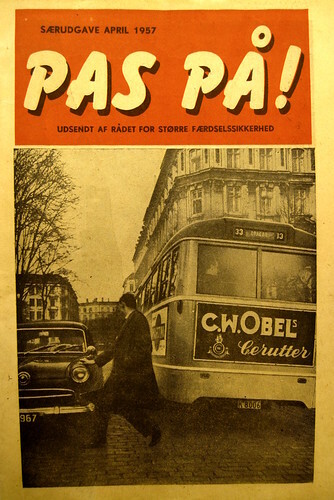 The Danish Road Safety Council have been protecting car culture since at least 1957. Above is their magazine called Watch Out! Inside the magazine there is even an advert for reflective clothing. "Cyclist and Pedestrian! Protect yourself and your children! Buy Pasma traffic safety clothing with reflective strips. These strips will warn cars and motorcycles of your presence at a distance of several hundred metres. Pasma clothes are available across the country. See demonstrations of the outerwear and trousers at your closest retailer." "One must be able to see the danger in order to avoid it. 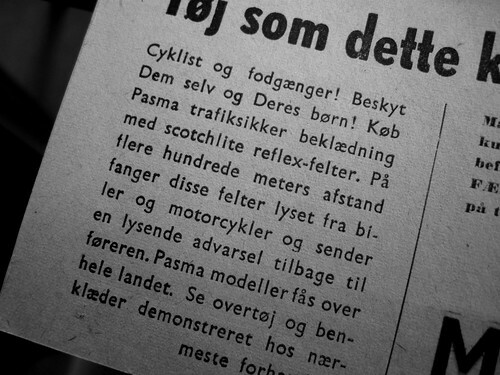 Therefore The Danish Road Safety Council recommends Pasma." You'd think that we would have learned a lot about traffic calming and reducing the danger that cars and motorists pose to pedestrians and cyclists in all the years since 1957. Alas, Bubble Wrap Society lives on and politicians continue to embrace the 'easy' solutions, both here in Denmark and abroad. 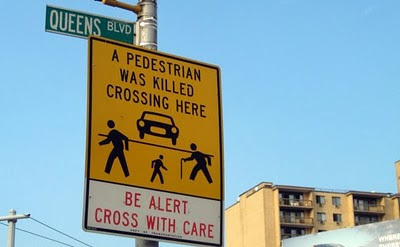 Placing the weight on the shoulders of cyclists and pedestrians. 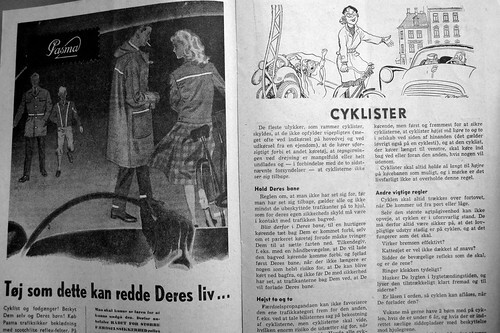 Here's a brochure from - shockhorror - Copenhagen condescending to the elderly by suggesting that they wear "bright clothing and reflexes". So no news about campaigns to reduce speed limits to ensure higher levels of traffic safety and reduce death and injury, just fearmongering and motor vehicle protectionism. Just like the pedestrian flags in Berkeley and elsewhere. In Toronto there have been 10 pedestrian fatalities since January 12th. A reader, Autumn, sent us this link about it from CBC News. Are there calls in the city for lower speed limits? One commenter on the article writes "The red hand means stop", which kind of says it all, really. Andy sent a link about a school in Norwich. "Children face being ordered by police to get off their bikes and walk on the pavement unless they are wearing reflective safety gear during the hours of darkness, although there is no legal requirement for cyclists, whatever their age, to do so." Here's the article from www.road.cc. There is a will to inform in some cities, even with the investment in and the production of solid, permanent signage. Unfortunately the message is sent to the wrong recipients. Cyclists and pedestrians instead of motorists.